The notice of right to lien form is used to put a property owner on notice that the person providing labor or materials for a construction project might have a lien claim against the property. In accordance with NRS 108.245, the notice of right to lien must be filed by every lien claimant, besides a prime contractor or other person who contracts directly with an owner or sells materials directly to an owner or one who performs only labor. The notice shall be filed at any time after the first delivery of material or performance of work or services under a contract. The notice must also be served by delivering it in person or through certified mail to the owner of the property. The notice is not a lien and does not provide actual or constructive notice of a lien for any purpose. The notice is merely a required step to notify a property owner of a potential future lien on his or her property. Unless the notice form is filed and notice has been given, Nevada law will not permit a lien for materials or equipment furnished or for work or services performed, except for labor only. The notice does not need to be verified, sworn to or acknowledged by a notary public. A lien claimant who is required under NRS 108.245 to give a notice of a right to lien to an owner and who gives such a notice has a right to lien for materials or equipment furnished or for work or services performed in the 31 days before the date the notice of right to lien is given. A claimant also has a right to a lien for the materials or equipment furnished or for work or services performed anytime thereafter until the completion of the work of improvement. The notice should be recorded promptly in a public records office. Although Nevada law does not state a timeframe for recording the notice, it should be recorded as soon as practicable without any delay. 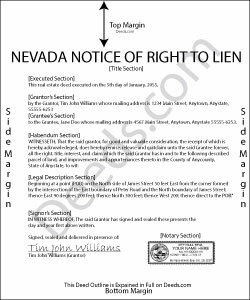 Although this guide and accompanying forms are prepared substantially in accordance with Nevada lien law, they are not a complete substitute for the advice of a competent, licensed attorney familiar with statutory and case law. Each case is unique and penalties for missing a deadline or misstating facts can be severe, so contact an attorney with specific questions or for complex situations.